The Sound Blaster ZxR is the flagship of the ultra high-performance Z-Series of Sound Blaster® PCI-Express sound cards, elevating the standards of technology and performance for the future of gaming and entertainment on the PC. 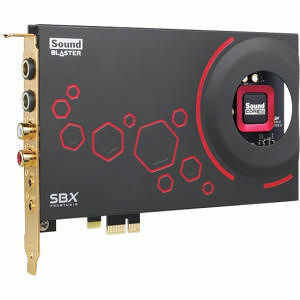 Designed to deliver the ultimate audio playback and creation solution for the PC, Sound Blaster ZxR personifies the ultimate gaming and entertainment performance for a sound card. Intel Core 2 Duo or AMD equivalent processor, 2.2GHz or faster recommended.